With three more posting days to Christmas, take a look at this Stirling card of 2004 which was in MP Anne McGuire’s annual Christmas Card Competition. Christmas cards have changed in the last ten years. The ecard market has grown; messaging on social media platforms is free and popular; schools are now busy with so many projects at Christmas that such competitions are now a thing of the past. This image has been retained in the Stirling Smith collections on account of its sense of place. 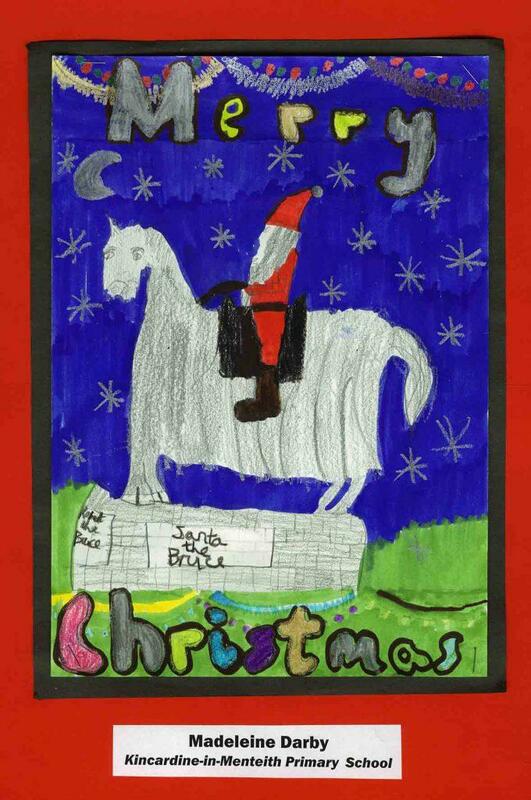 The young artist has combined two legendary heroes in Robert the Bruce and Santa and placed them in a Stirling context. The Bannockburn statue by sculptor Charles de Orville Pilkington Jackson was erected 50 years ago, and it has burned itself into the consciousness of people world-wide. Note that the young artist has depicted the granite plinth, designed for the statue by architect Sir William Kininmonth, with some accuracy. Part of the success of the statue is the suitability of the plinth design. When the sculptor and architect work separately, as they did on the Rob Roy statue in Corn Exchange, the sculpture can be left looking odd and out of proportion. Earlier this year both the Bruce statue and plinth were meticulously restored for the 700th anniversary of the Battle of Bannockburn, and are well worth a visit. There was once a tradition of visiting the Field of Bannockburn on New Year’s Day, when there was only the Borestone, a flagpole and the tin hut of the Bannockburn Guide. There is now so much more to enjoy. Is Elspeth King related to Andy King who edited the Scalacronica? sorry for tkaing so long to return your enquiry, Elspeth has been on holiday for a few weeks. I’ve asked her and no she is not related to Andy king.